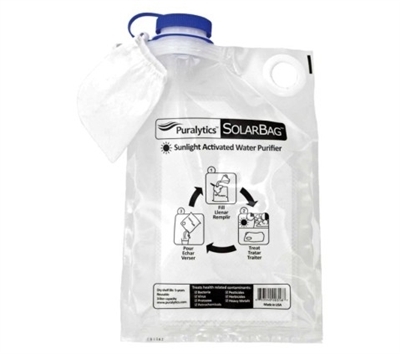 The SolarBag purifies 3 liters at a time, and can be used several times per day, on sunny or cloudy days. It is simple to operate, using the sunlight to activate the nanotechnology coated mesh insert to purify water. No chemicals or pumps are required, and it can be reused hundreds of times. SolarBag is capable of treating organic contaminants and heavy metals including: Bacteria, viruses, protozoa, pesticides, herbicides, petrochemicals, pharmaceuticals, arsenic, lead and mercury. Treatment time ranges from 2-6 hours depending on cloud cover and water quality.